Experience living history at Caprock Canyon State Park. That’s where you’ll find the state’s official bison herd. This bison herd was started by Charles Goodnight in 1878. It’s one of the only remnants of Southern plains bison that are left; it’s one of the five foundation herds that all bison today are related to. They’re important culturally and historically. Donald Beard is Caprock Canyon State park superintendent. 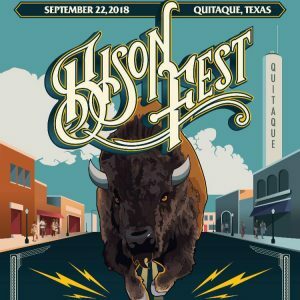 On September 22, the Texas State Bison Music Festival takes place in downtown Quitaque, Texas. The festival is to raise awareness and to raise funds for the Texas State Bison herd and their restoration inside of Caprock Canyon State Park. Bison Fest offers a full day and night of activities, music and dancing for the entire family; children 10 and under admitted free. Proceeds fund important work. We’re trying to restore the park back to its original appearance prior to European settlement. Which means we’re trying to remove a lot of the invasive mesquite and junipers, and restore a lot of the rolling plains. We’re doing some scientific research on the bison; we’re looking at all that. We’re [also] trying to do some citizen science projects, where we’re trying to get park visitors involved in helping us to do some of the restoration work—or at least monitoring part of the work. We’ve got a lot of neat stuff that we’re working on. Find ticket information and a full list of performers for the Saturday, September 22 Bison Fest at bisonfest.com. Support for our show is provided in part by Ram Trucks. Built to Serve. You are currently browsing the Passport to Texas weblog archives for the day Monday, September 3rd, 2018.